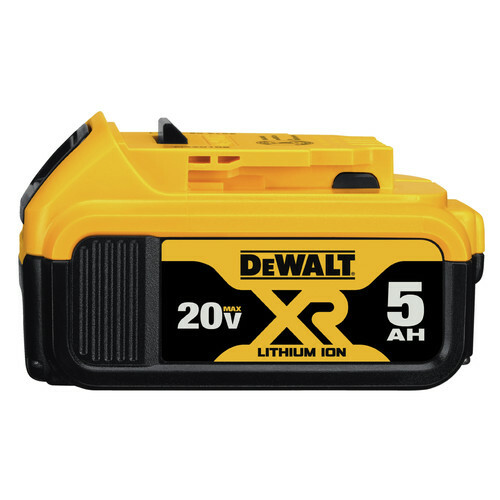 The DEWALT DCB205 20V MAX 5.0 Ah XR Premium Lithium-Ion Battery Pack will provide up to 60% more capacity than a standard 20V MAX battery pack. The 3-LED Fuel Gauge System allows gives you instant feedback on the charging state. These XR Premium batteries have no memory and virtually no self-discharge for maximum productivity and minimal downtime. This is the third battery that quit working in less than a year. Get battery tools that have a better warranty on their batteries. If I did not have every Dewalt tool I would change to another brand. This battery has a very long run time and is a nice weight. it work better than i thout, and no gas, and you can use a inverter on your truck. I have an array of a power tools at home. Expending the inventory and seeing less and less interoperability. What is the point of having different charger to every other power tool. Who is that 'wise' to come up with this short-term idea? works in all my 20v tools and I have many. I have enough of these and these have such long run times I feel confident I won't have to stop in the middle of a project waiting for a battery. Bought an adapter with it and used it on my 4 1/2 grinder...... Very impressed. Will DCB112 charger work with DCB205 battery? BEST ANSWER: Yes, the DCB112 will be compatible with the DCB205 Battery. Will a DCB107 charger work with the DCB205 battery? BEST ANSWER: Yes, the DCB107 will charge the DCB205. Will this XR battery work with a 20volt max non XR impact?